Hunter will execute a year-long PR program to elevate the conversation about the Bic Fight For Your Write mission. SHELTON, CT: Bic Consumer Products USA has selected Hunter Public Relations as its marketing PR AOR for its line of stationery products, lighters, and shavers. Bic and Hunter began working together this week, following a formal RFP process that started in late 2015. It brought on Hunter to help it reach consumers in "unique ways" and add depth to the company’s integrated campaigns. Hunter will execute a year-long PR program to elevate the conversation about the Bic Fight For Your Write mission for the company’s stationery brand. 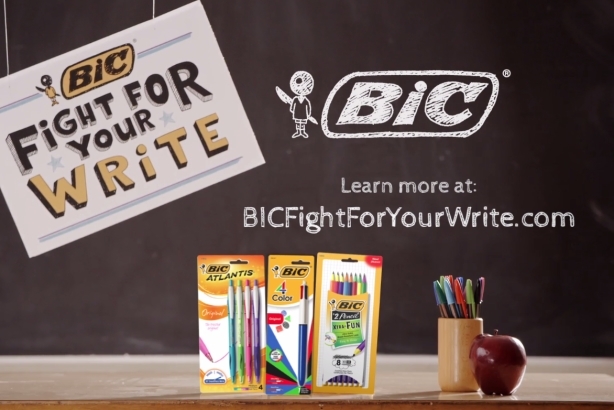 Hunter partner Jason Winocour, who is leading a core team of five on the account, explained that Fight For Your Write is a campaign Bic has been running for a few years. However, the company wanted a new agency to "dimensionalize it and give new life to it," he explained. "Fight For Your Write really talks about the benefits of handwriting," Winocour said. "So we will be engaging Bic consumers in new and unique ways as it relates to getting folks to be more fully engaged and appreciate the power and the cognitive and emotional benefits of handwriting." Hunter PR will also provide marketing PR services for Bic Flex razors and Bic Soleil razors, as well as support for Bic Lighter programs. "In seeking a marketing PR agency for our U.S. consumer business, we were looking for bold, higher-purpose thinking that would honor the powerful Bic brand and invigorate our PR," Alexis Vaganay, Bic North America’s VP of marketing, told PRWeek via email. "Hunter PR brought forth strategic, insights-driven ideas that will allow us to reach our consumers in unique ways and add new depth to our integrated campaigns." The incumbent on the account was Cashman + Katz, which is staying on as Bic’s AOR for corporate communications. "We think Bic is a great fit for us," Winocour added. "We really have deep experience in partnering with iconic brands in the home, lifestyle, and personal care sectors."